Maryland Gov. Larry Hogan is proposing a dramatic $9 billion project to ease traffic congestion that includes adding four new lanes to the Maryland side of the Capital Beltway, Interstate 270 and the Baltimore-Washington Parkway. WASHINGTON — Maryland Gov. Larry Hogan is proposing an ambitious $9 billion project to ease traffic congestion that includes adding four new lanes to the Maryland side of the Capital Beltway, Interstate 270 and the Baltimore-Washington Parkway. The plans also calls for the addition of new express toll lanes on all three of the routes. The additional lanes on the Beltway would run from the American Legion Bridge to the Woodrow Wilson Bridge, according to the proposal Hogan laid out Thursday morning. 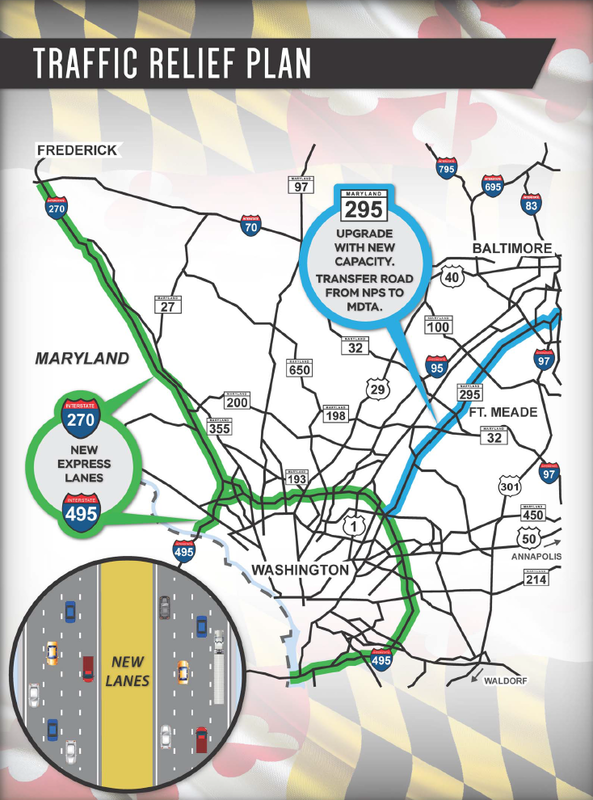 The four additional lanes on I-270 would run from the Capital Beltway to Frederick. The additional lanes on I-295 would run from Baltimore City to D.C.
“These three massive, unprecedented projects to widen I-495, I-270, and Md. 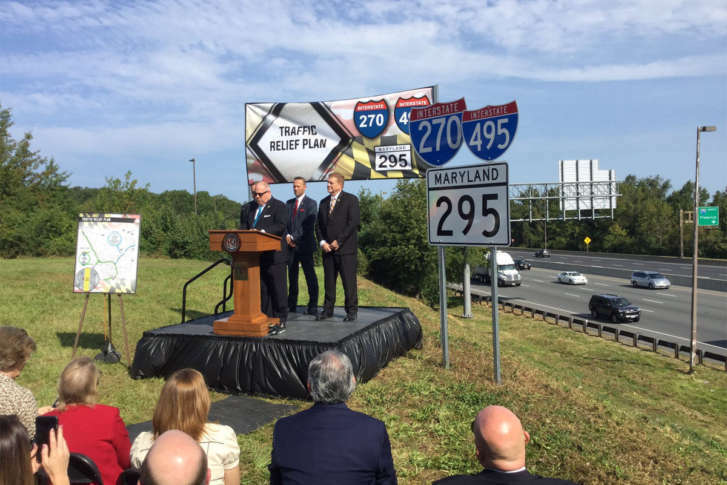 295 will be absolutely transformative, and they will help Maryland citizens go about their daily lives in a more efficient and safer manner,” Hogan said in a statement. The governor’s announcement amounts to the first step in what is expected to be a lengthy and potentially contested process. Click to view the image full-size. Hogan said the project will be managed as a public-private partnership and that private developers would be tasked with designing, building, operating and maintaining the new lanes. The project is still in the request-for-information phase. It’s unclear what aspects of the project, if any, would require signoff from any parts of the Democratic-led legislature. Amelia Chasse, a Hogan spokeswoman, said in an email to WTOP that the Maryland General Assembly has the opportunity to review and comment upon the plan. Building new express toll lanes on the Baltimore Washington Parkway requires the U.S. Interior Department to transfer the parkway land, which the federal government owns, to the Maryland Transportation Authority. Hogan said he recently met with Interior Secretary Ryan Zinke to “personally” kick-start the process. to issues involving the Baltimore-Washington Parkway were made during that meeting,” Hinson said. “This is day one of what should be a considered process and we’ve got to carefully analyze the plan and the costs, but I am encouraged that we’re finally moving forward and I’m supportive of the state thinking about these kind of big solutions to big problems,” Delaney said. In a statement released Thursday, the Coalition for Smarter Growth, a group that advocates for public transportation, blasted Hogan’s proposal as a “highways-first” approach” to transportation issues. “Smart growth, demand management, and transit investments are the only fiscally-responsible long-term approach, but the big multi-national toll road construction consortia have been hijacking our transportation planning process promoting massive toll lane projects,” said Stewart Schwartz, the group’s executive director, in a statesmen. The coalition said the governor should pause the multibillion-dollar plans and consider a broader approach that includes completing the first phase of the Purple Line and a dedicated express bus lane that ties into the I-270 HOV lanes at the American Legion Bridge bottleneck. Editor’s note: This story has been updated to remove that State Democratic Sen. Rich Madaleno said Gov. Hogan has to get approval for the plan from two budget committees before moving forward. The committees can comment and review rather than approve. Madaleno is running for Maryland governor.